Avere opportunità per sé e per la propria famiglia. Conoscere. Tutto questo e molto ancora ha rappresentato il trasporto pubblico per Bellusco. Lo sviluppo sociale, culturale ed urbanistico del paese è fortemente influenzato dalla presenza di questo servizio e dalla posizione lungo l’asse stradale che collegava Monza e Bergamo. 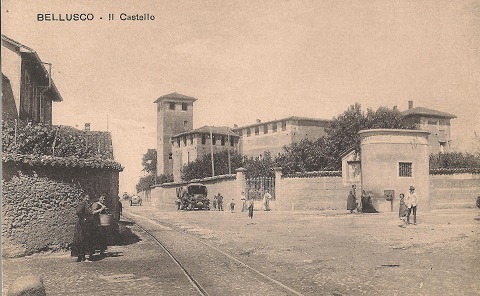 I riflessi della Storia erano vissuti dai Belluschesi su questa strada, percorsa da carri e cavalli prima, poi, dal 1890, dal tram, chiamato in dialetto Gamba de Legn (Gamba di legno), sostituito nel 1958 da un servizio di autobus, tuttora esistente. Il collegamento con Vimercate e da lì con Milano e le principali fabbriche ha avvicinato i Belluschesi a lavori nuovi, consentito l’accesso a scuole di grado superiore e, in generale, ha dato l’opportunità di una maggior conoscenza di quello che nelle diverse epoche avveniva al di fuori del paese. Durante la seconda guerra mondiale il tram venne mitragliato poco fuori dal centro abitato da alcuni aerei angloamericani che volevano colpire le linee di comunicazione. Era il 28 ottobre 1944: numerose furono le vittime ed i feriti vennero assistiti dai cittadini accorsi in strada. Fu senza dubbio il maggior avvenimento in paese legato al conflitto: la guerra era tragicamente entrata nelle case dei belluschesi. 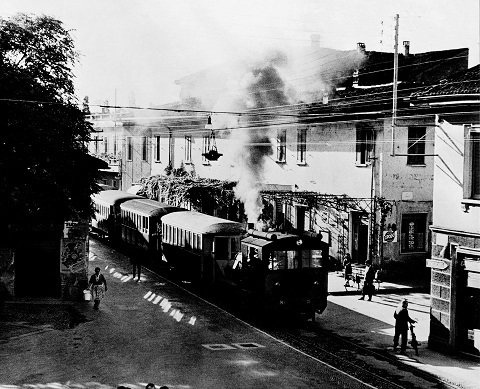 The social, cultural and urban development of the town of Bellusco is deeply affected by its public transportation system and its position along the route that linked Monza with Bergamo. The sense of history was felt by the people of Bellusco -the Belluschesi- along this road, which was originally used by carts and horses, then starting from 1890 by the tram the locals liked to call Gamba de Legn - Wooden Leg - until this was finally replaced in 1958 by the bus service currently operating. During World War II, on 28 October 1944, the tram was hit in the outskirts of the town by some Anglo-American planes that aimed at disrupting communications. It was 28 October 1944: many people were victims in the attacks and the Belluschesi rushed to the street to take care of the wounded. This was without a doubt the major conflict-related event in town: the war had tragically entered the homes of the Belluschesi. There are so many ways to tell a country. Why is a country many things . The path that we invite you to follow part by the people who have lived , who live. Walking through the streets , looking with another look, we perceive and understand not only how these ways of living but become signs in everything that surrounds us. Sometimes it will find signs, sometimes read up a bit ’ more. But the desire is that the the end of this path are more questions answers, that the search continues as the desire of each and everyone. We identified some significant places from the historical but above all because of the influence that these had and have in social development of the country. Places of memory but not the be aware that the country is more than the sum of streets, squares, houses and monuments. Up to you to find out why.